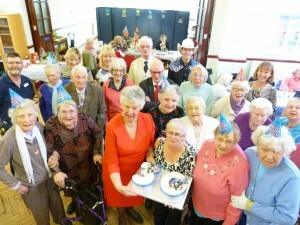 PATRONS, staff and volunteers of St Mary’s Centre for the Community in Byfleet raised a cheer on Wednesday last week as they celebrated the hub’s 30th birthday. Renovated and refurbished, the building was renamed to its current guise and officially opened in 1986 by Diana, Princess of Wales. Since then, the centre has become a hub for social, educational, health, general community and recreational events and activities. Councillor Melanie Whitehand, Portfolio Holder for the borough’s Centres for the Community, said: “This is a very special day for everyone involved with St Mary’s Centre for the Community. “We are all extremely proud of the services it offers to the local community and we look forward to welcoming many more visitors over the coming years. Byfleet resident and former St Mary’s volunteer, Sheila Bailey, added: “I was a volunteer at St Mary’s the very first day it opened and have a photo of my mother with Princess Diana when she visited to officially opened St Mary’s. Guests enjoyed a mouth-watering two-course lunch, followed by live entertainment by local musician Stu, featuring easy listening popular classics perfect for a dance and sing-a-long.